Jack Holder riding for Panthers against Workington last weekend. Top talent Jack Holder admits he would be happy to race for Peterborough Panthers again next year. The Australian ace has been the star of an ultimately disappointing season for the city club, who have fallen well short of their play-off target in the SGB Championship. But it is has been a stellar year for the 21 year-old on a personal level as he has piled almost two points onto his starting average and emerged as one of the finest young riders in the sport. 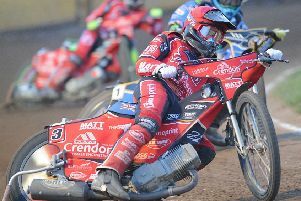 Holder’s progression included a debut in the Polish Ekstraliga when he was called up by Torun as a replacement for injured world champion Greg Hancock last month. That was a move which led to a major storm as Panthers owner Ged Rathbone had his British Speedway Promoters’ Association (BSPA) licence suspended for giving Holder the green light to head to Eastern Europe rather than race in the SGB Championship Fours – an event the city side went on to win without him! Holder said: “It’s pretty silly what has happened. Britain is a stepping stone at the moment because there aren’t many of the big boys riding here. “I can’t thank Ged and the club enough for doing what they did. He has copped a fair bit of stick, but he is one of the best promoters around. “I’ve loved riding here. I love the track and the fans, and I would love to be back next year as well. “I’ll be racing in Poland regularly on Sundays, but if Peterborough are prepared to work around me, I won’t go anywhere else in this league. “I know some of the fans were disappointed because they always want me to be riding here, but I had to take an opportunity in Poland that was so good for my career. “I didn’t actually think I was ready for it, but I guess my scores over there showed I am. Holder was hugely impressive with a 15-point haul as Panthers beat Workington 51-42 last Sunday. He reeled off wins in the opening four rides of his first Alwalton appearance since July to inspire the city club to a second successive win on their own shale. Panthers travel to Glasgow this Sunday (3pm) before Holder and Chris Harris return to Ashfield Stadium for the second tier riders’ championship on September 24. Holder experienced a rare disappointment when only managing six points in the second round of the World Under 21 Championship Final at German track Gustrow last Friday.